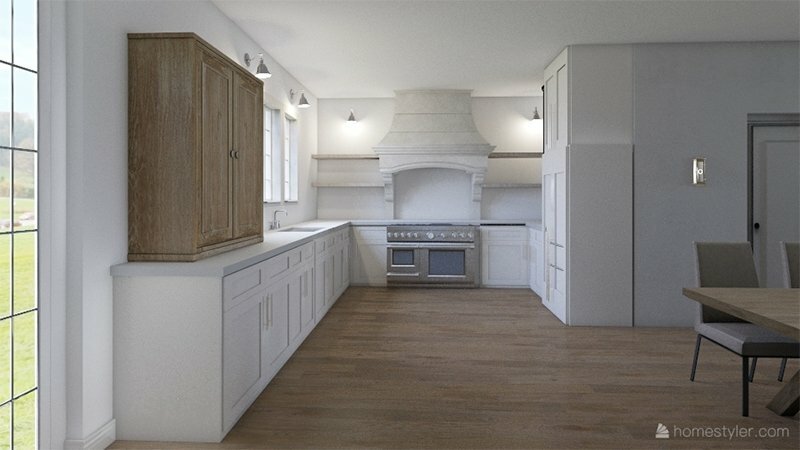 This kitchen has been almost a year in the making, if you can remember the first post last February sharing our plans for the original Heights House. 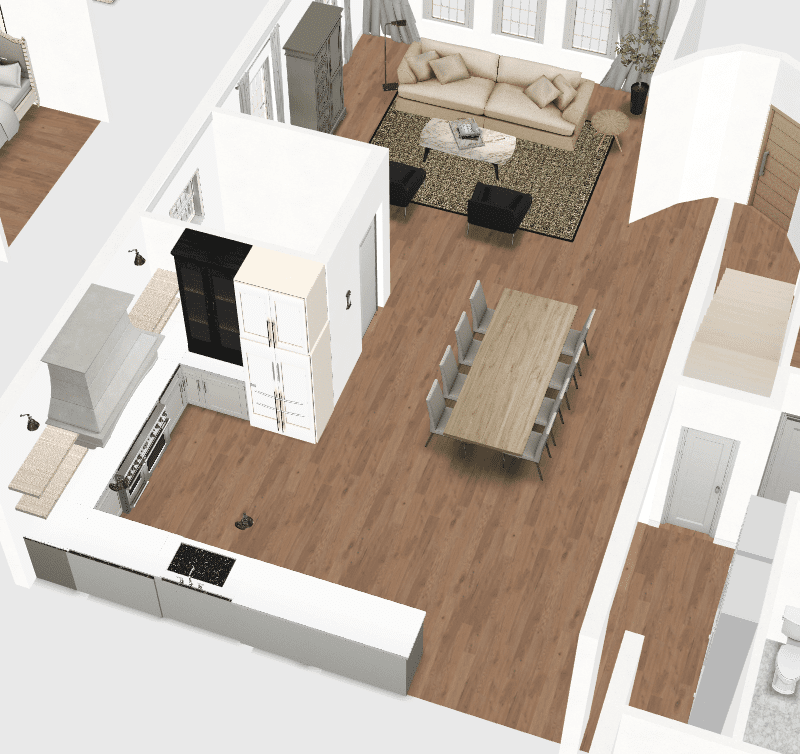 Oddly enough, even though we have built an entirely new house, the kitchen plans have remained close to the same. The location and layout were perfect (with a wall of windows and patio doors facing the giant oak in the backyard) and we were really happy with the design, so there was no reason to reinvent the wheel. 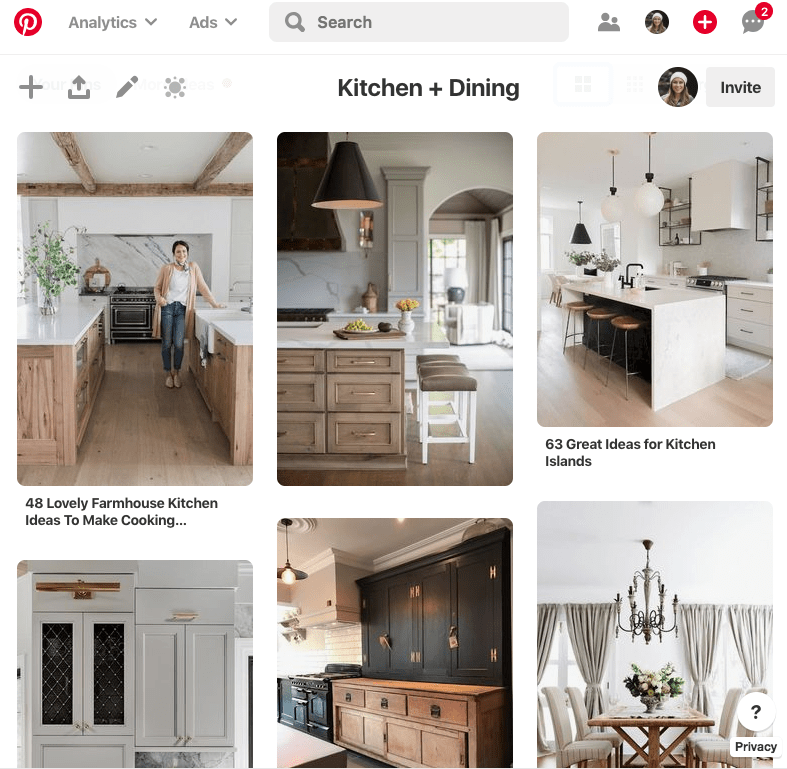 I’ll be sure to go through the design plan for each room in depth in upcoming posts, but today we’re focusing on the heart of the home—the kitchen! The unkitchen feels more like an extension of a home’s living space—it utilizes furniture, open shelving, vintage pieces and appliances, as if it has been collected over time. It feels fresh and cozy, not uniform and sterile. Laurel’s description and images were such an a-ha moment for me—I have been drawn to this idea for a while, especially after living in other parts of the world for the majority of 2017, and I want this to be reflected in my own kitchen. 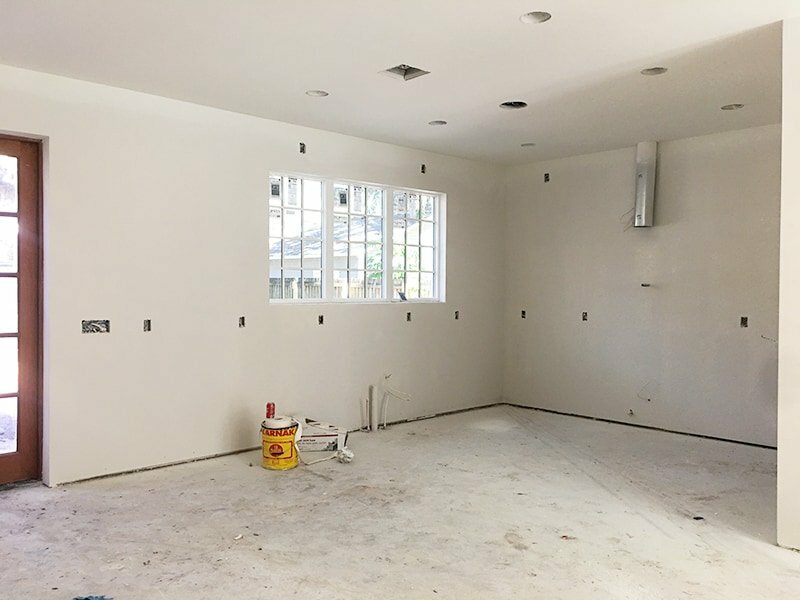 Lucas and I have given a lot of thought to what our needs are for the space, and the main functional desires are a large, high quality range (I love to cook), large windows with a backyard view, and storage features that maximize cabinet space and make workflow easier. It’s just the two of us and we don’t have a lot of stuff, but we do like to entertain and need the capacity to host larger gatherings. 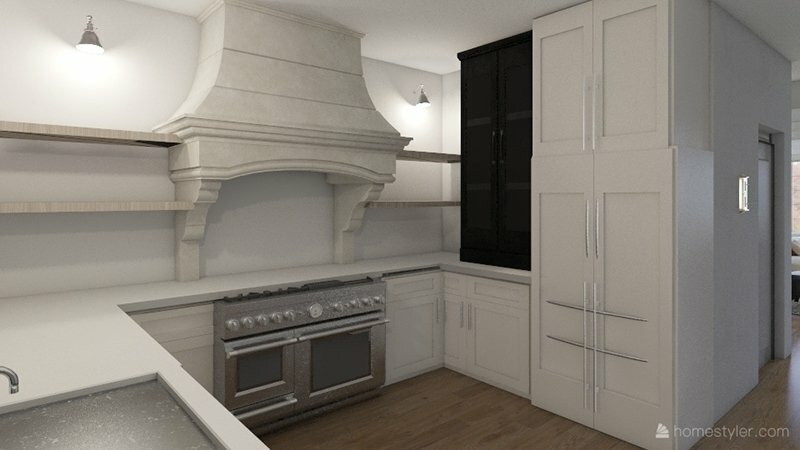 On the design side, I’ve been pinning inspiration and narrowing down my aesthetic for well over a year so I had a good idea of what I wanted going into this, and even with a new house to design for, the plan hasn’t changed: mushroom shaker cabinets, marble (quartz) countertops, wood floors, white + integrated/hidden appliances only, a large custom range hood, open wood shelving, an antique wood hutch, vintage-style lighting and brass accents. 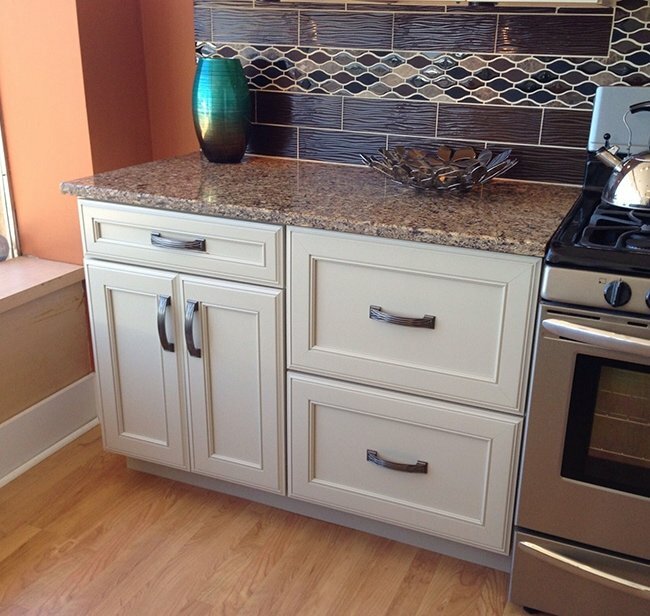 No upper cabinets, no stainless steel, no tile backsplash. 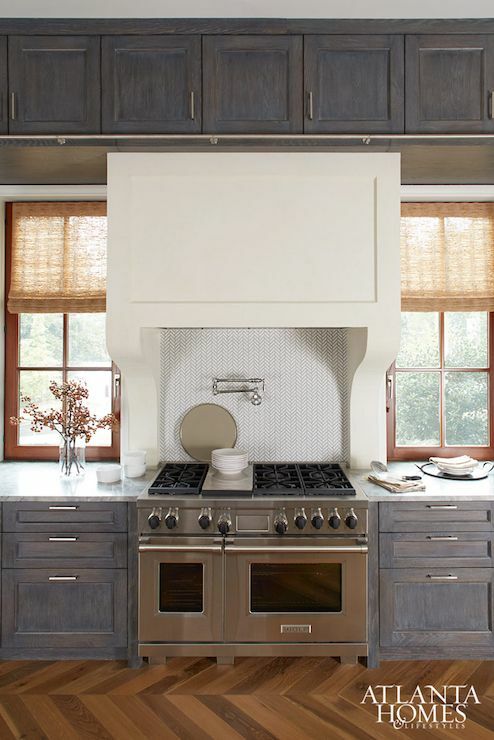 If I had to use labels, this kitchen would be classic, European, earthy, casual, minimal. 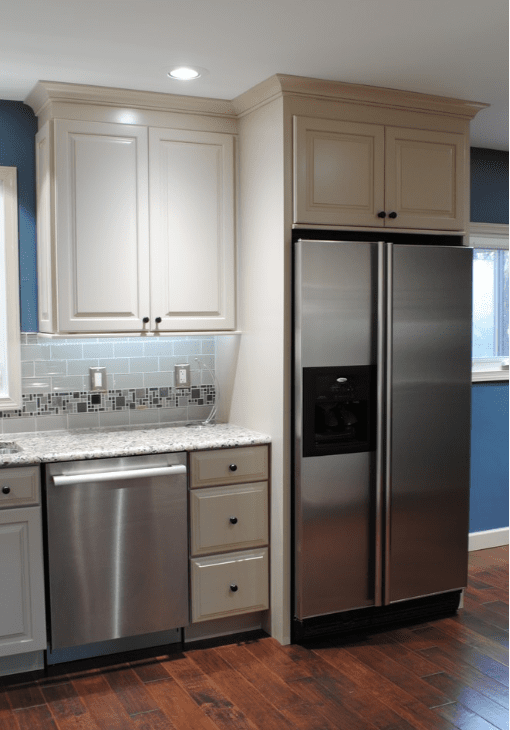 I had the amazing opportunity to work with Lowe’s on this kitchen again (you may remember my first Modern Farmhouse kitchen from in 2012 and the Cottage Flip kitchen in 2016, both used Lowe’s cabinets, counters & appliances). They decided to step in as a sponsor on this project and have stuck with us through all the setbacks last year, and we’re so grateful for their patience—especially our kitchen designer Angela, who has sat through countless hours of meetings and revisions with us! 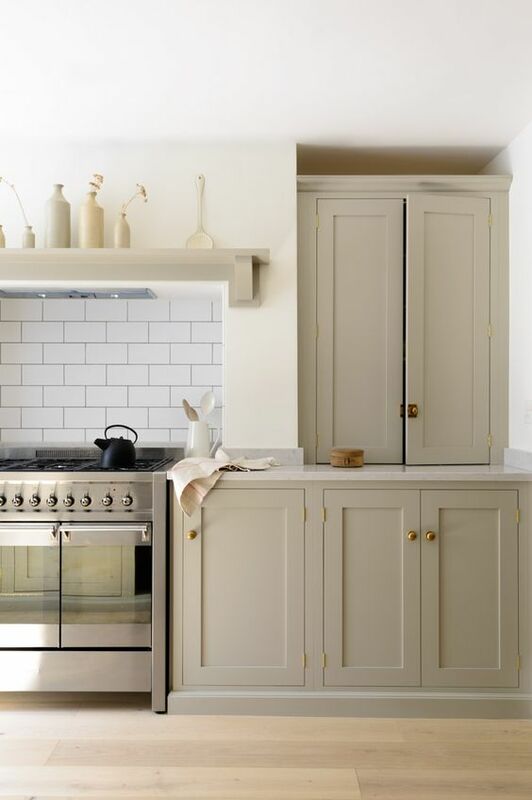 I was sure from Day 1 that I wanted mushroom shaker style cabinets (thanks to the DeVol Kitchen image above) so my primary mission going into this was to find the perfect shade of mushroom, no matter the brand. From top to bottom: Diamond Egret, Diamond Lambswool, and Kraftmaid Mushroom. These are shown next to the Pergo flooring that we were going to install in the original house, but ended up using at the Riverside Retreat instead. I went back and forth between all three colors for the longest time. 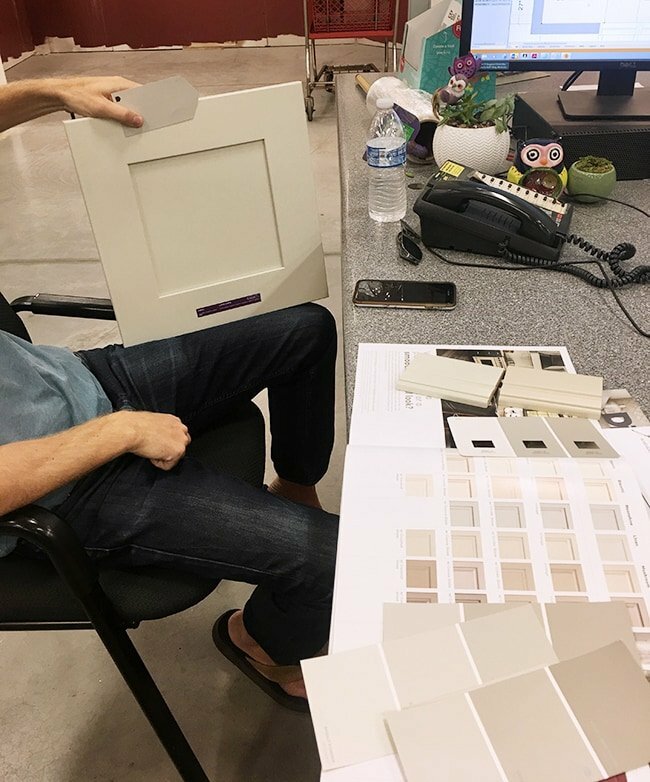 Cabinet color choices are even trickier than choosing paint, especially since they’re permanent. I ordered small samples to take home with me, but they look different in every light so it’s still a tough choice—especially when there’s no house to look at the samples in! And with that, our final choice was the Kraftmaid Durham Maple Square in Mushroom. 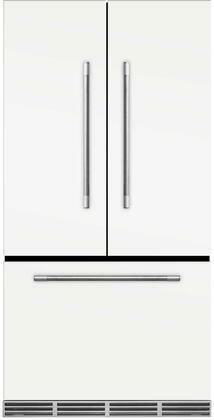 With the cabinet brand, color and style solidified, our kitchen designer worked with us to design the layout. 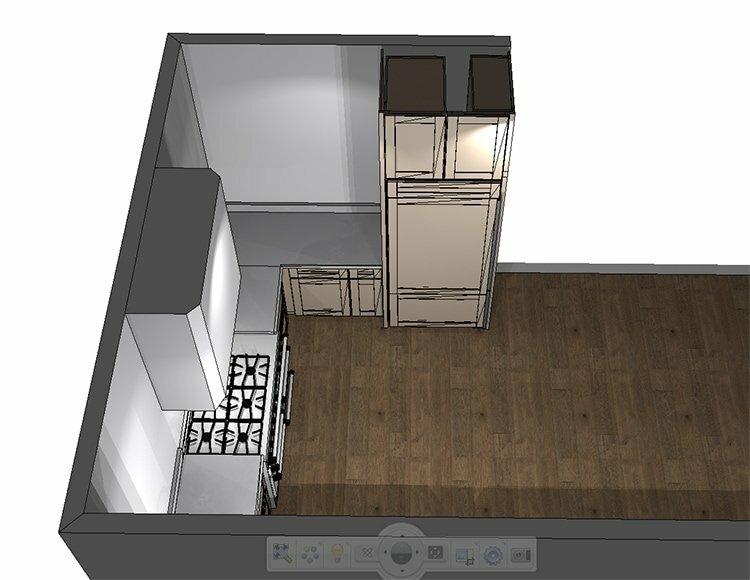 We already had an overall plan in mind (placement of appliances, general idea of sizes/cabinet types) but Angela helped us choose the exact cabinets we needed to fit our measurements. 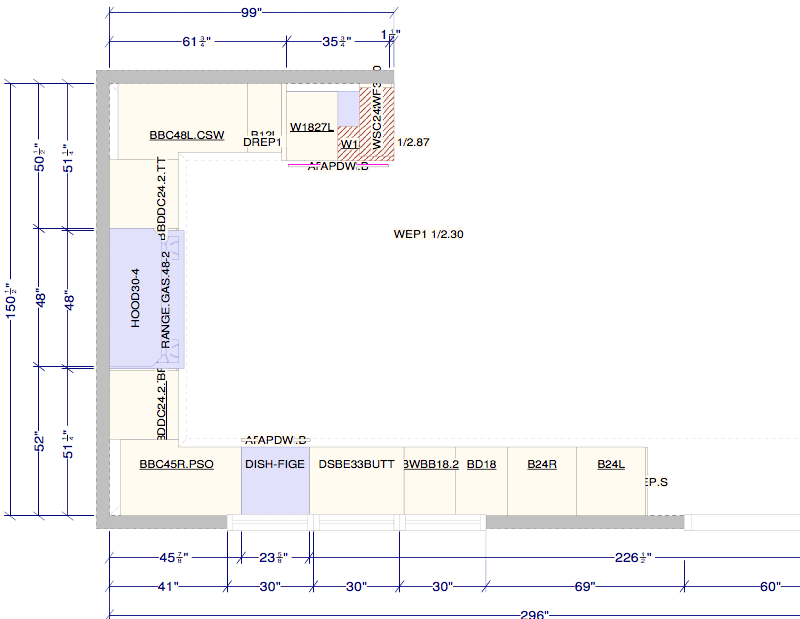 In the layout above, the cluster of cabinets on the top right is the fridge location (along with a custom mix of upper cabinets which I’ll explain in a second), the large purple box on the left wall is the 48″ range, the dishwasher is the other purple box on the bottom wall, and to the right of that is the sink. The rest are a mix of drawer/door lower cabinets. 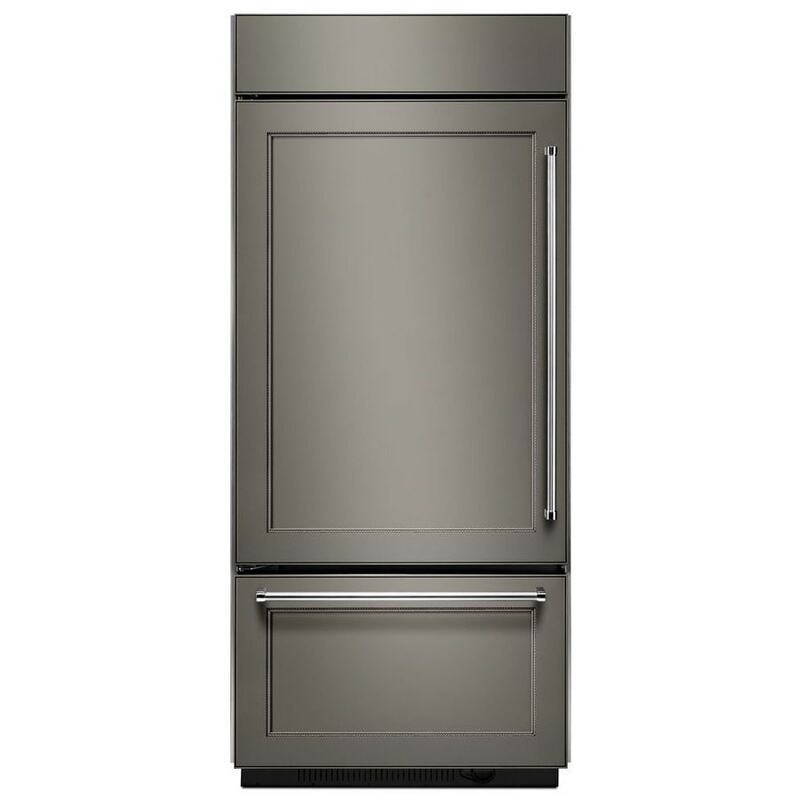 This isn’t representational of the actual color, of course—just the cabinet type/sizes. 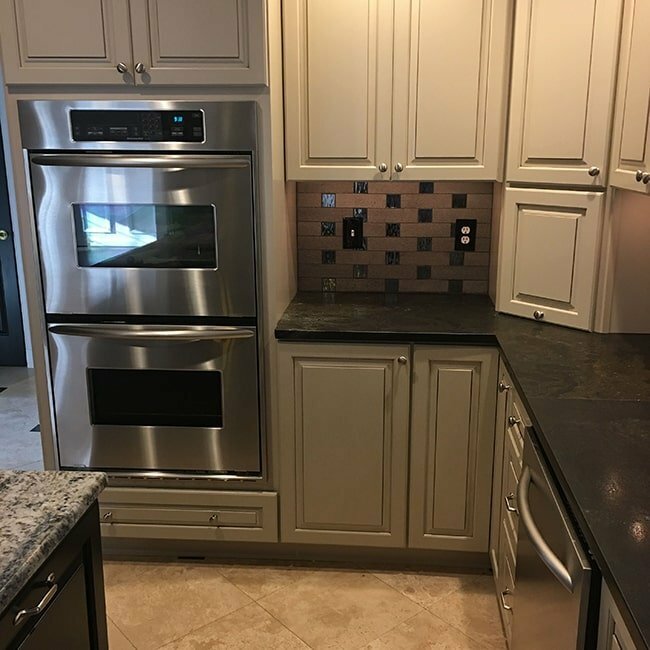 We chose two extra large drawers on either side of the stove, which have hidden pull-out shelves and storage compartments for spices, pots and pans, cooking utensils and baking dishes. Above the fridge, the right half of the cabinet will be wine bottle storage, and we plan to mount a ladder to a rail on the side of the cabinet for easy access (and because it’ll look awesome). 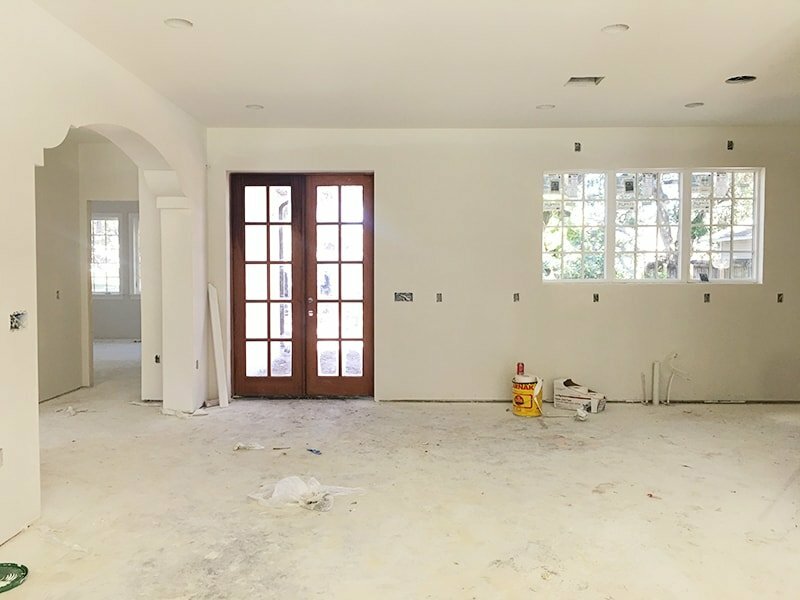 In the open wall space between the doors and windows, I plan to find an antique wood hutch to set on top of the cabinets. This will hold all of our glasses/barware, and potentially the microwave if it’s deep enough. 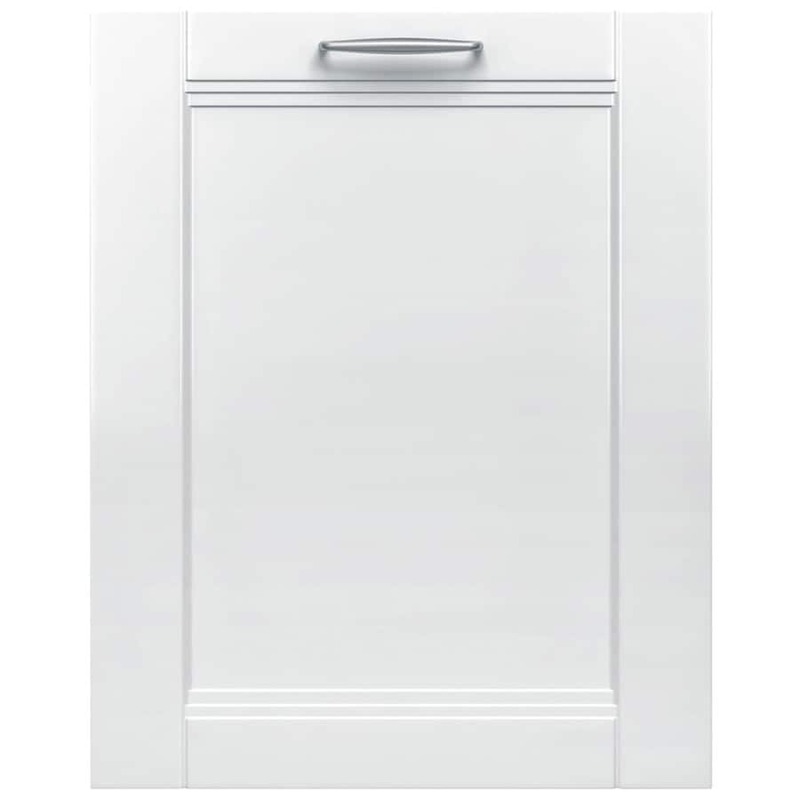 The 48″ lower cabinet with doors will have pull-out drawers and will hold all of our smaller appliances. The cabinet with drawers to the right of that will hold all of the utensils, and the drawer/door to the right will have a knife block with a pull-out garbage underneath. Then we have the sink cabinet, integrated dishwasher, and corner cabinet which will hold mixing bowls/tupperware/containers. 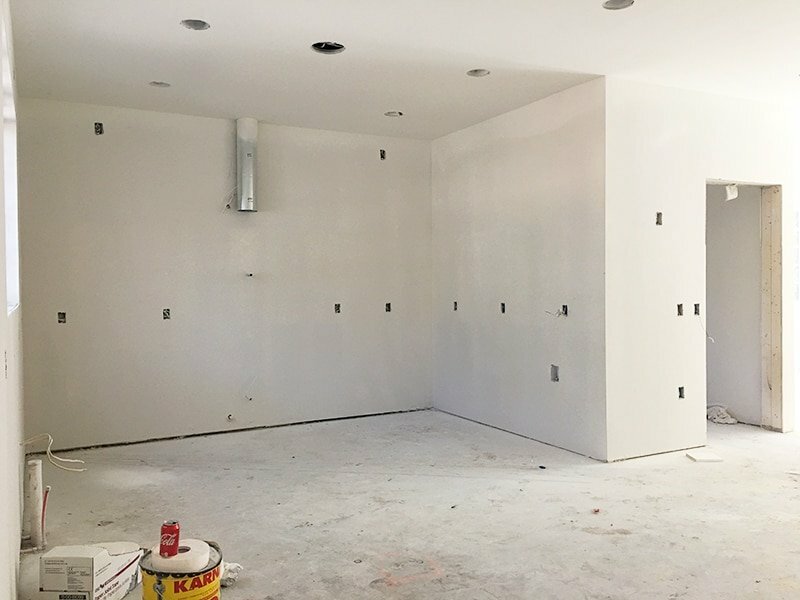 We opted not to add cabinets along the whole fridge wall, as we’ll have open shelving that runs across the entire range wall. Above the fridge, the left side of the cabinet will be operational, and the right side will have a door to hide the wine cabinet (which is exposed on the right). Pretend the cabinets are mushroom, the stove isn’t stainless, the wood hutch is more antique and the sconces & hood are different. Then you’re getting closer. The open shelves will hold all of our bowls, plates, ramekins, perhaps a few books and any display-worthy items. To the left of the fridge I’m considering adding a glass bookcase of some sort (ideally with a black frame), perhaps lining the glass with curtains and using it as dry food/pantry storage. Or possibly to hold the microwave if it’s deep enough. I haven’t figured it out yet, but I’d prefer to live with the kitchen as-is for a while to see what our needs actually are, and go from there. 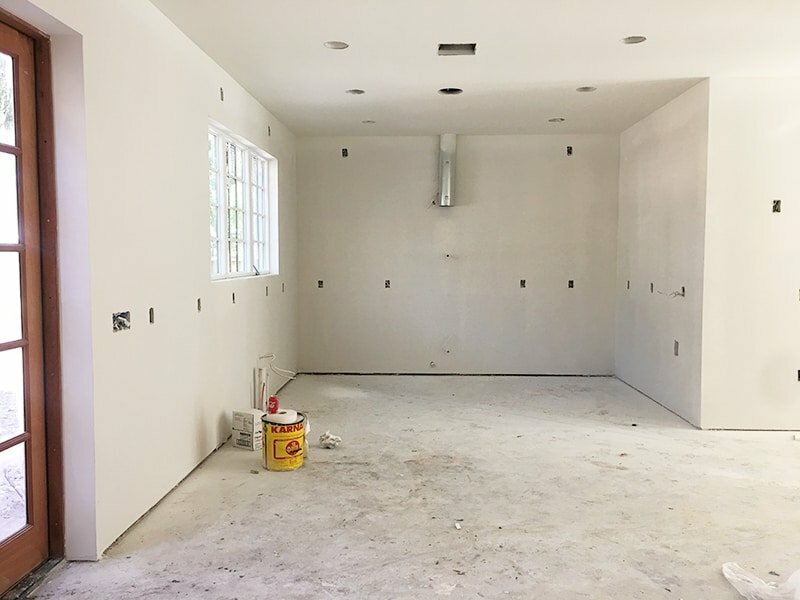 Keep in mind that we plan to add cabinets with cleaning supplies and pantry storage in the laundry area just to the right of the fridge (you can see the door to that room in the image above). Is it all starting to make sense now? Good—let’s move onto the details! It’s a quartz stone, which is non-porous and stain resistant. I used Silestone quartz in my Modern Farmhouse kitchen and loved the look and durability, so it was an easy choice to use them again. We visited our local stone yard to see the slabs in person and make sure it was what we wanted. I’d highly recommend considering this as an option if you love the look of marble but don’t want to stress about the maintenance! This is actually something I haven’t entirely figured out yet. I know the size and overall look I want to achieve, but I haven’t been able to pinpoint the exact shape/design. Here’s a few that stood out to me on Pinterest—although none are exactly what I had in mind. Another no-brainer going into the planning stages was to minimize the look of the appliances, and/or make sure they enhance the design. With the stove being the main focal point in the kitchen and also the most used/functionally important appliance, it had to be right. 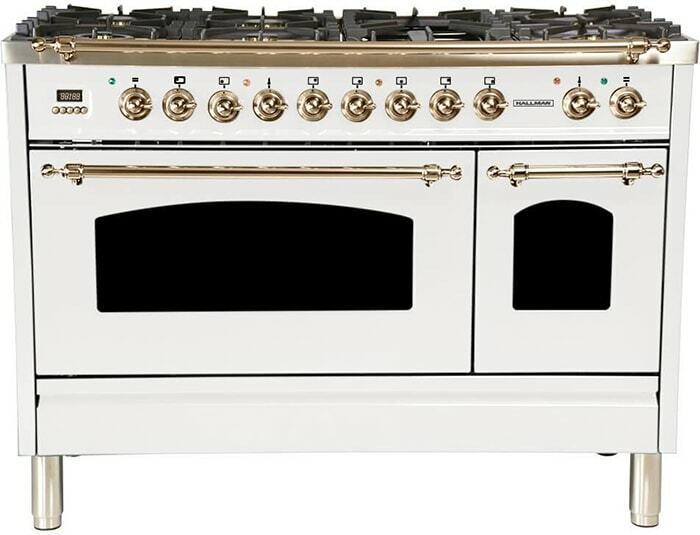 A finely crafted 48″ duel-fuel Italian range in white with brass accents—at just over half the cost of the AGA. TAKE MY MONEY. The only problem? 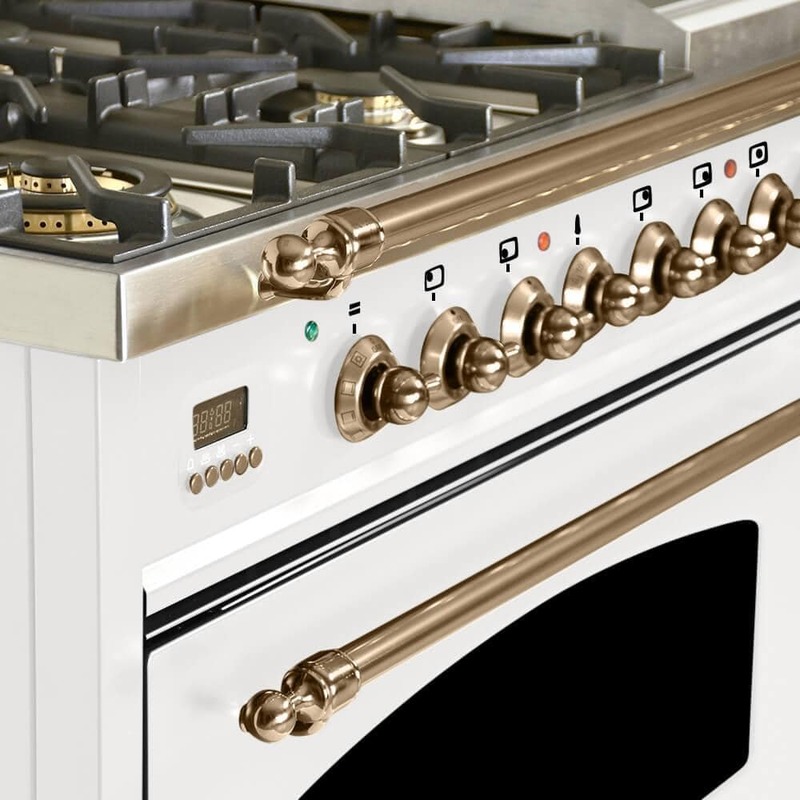 It’s custom made in Italy with a 17 week lead time… which means we would be going months without a stove. In the end, we decided it was worth the wait and placed the order a couple weeks ago. 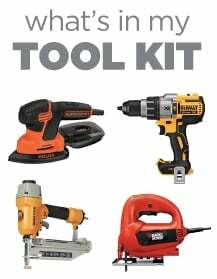 This range is available from a few different stores online, but Appliances Connection had the best price (we used their SAVE30 coupon code for $30 off) plus they have a rewards program which we signed up for as we’ll be needing more appliances in the future. We also opted to buy the matching toe kick which I think it makes it look much cleaner. 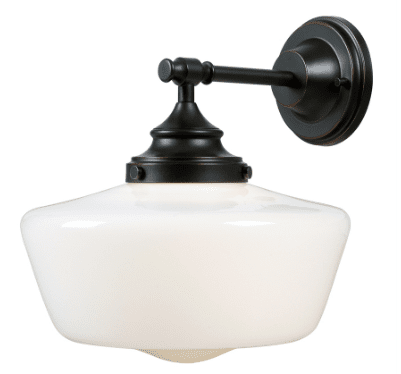 I love the clean and simple design, and it’s a well-known brand with solid reviews. The panels would be replaced with matching Kraftmaid cabinet fronts, of course. 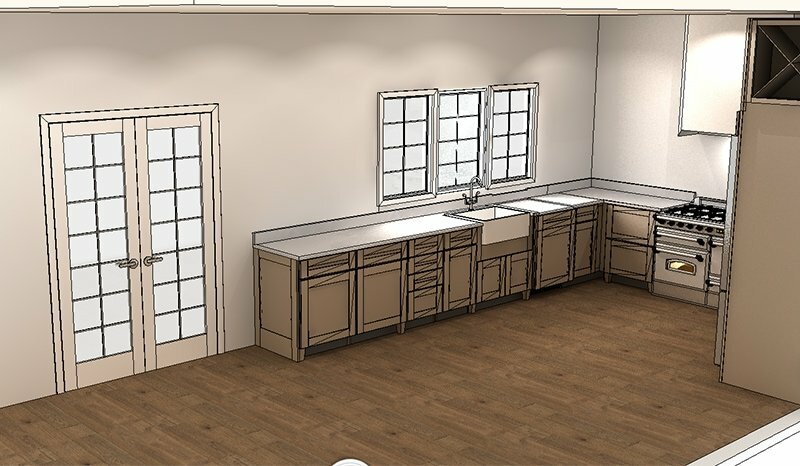 The cabinets won’t arrive until February 6th, so we aren’t in a big rush to order the appliances just yet since they’ll need to be installed after the cabinets. We haven’t ordered this yet either, but will be doing that within the next week! 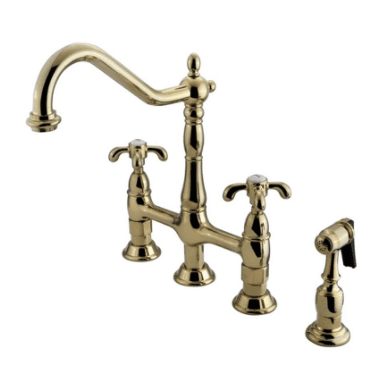 Both are 30″ sinks that will be fit into a 33″ cabinet. 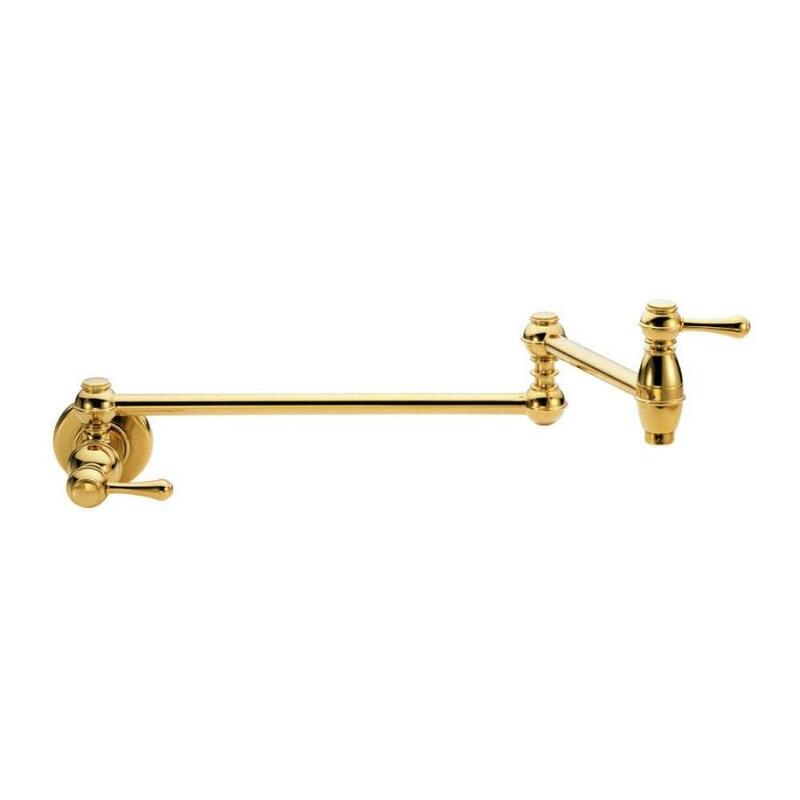 We’re also installing a pot filler above the stove—can you picture this vintage style brass hardware against the stone backsplash? 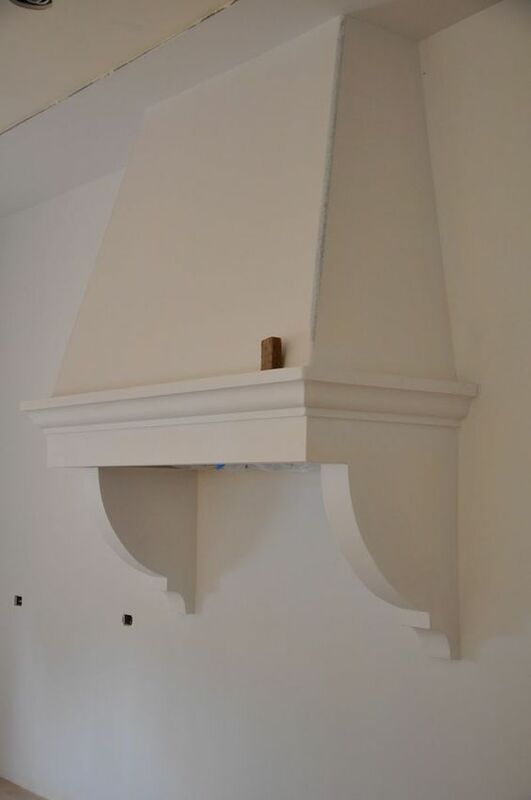 There will be 4 in total—two above the sink windows, and one on each side of the range hood centered over the shelves. I love that they’re simple, vintage looking, and only $79! You may have noticed that I haven’t mentioned anything about an island in this plan. As much as I love a good island, I’m not sure if it will be needed or if we’ll even have room. If we were to add a small island (24″ wide as depicted above) in the center, that would leave 3′ of space to walk on either side. To me that would feel a bit cramped, but it’s hard to tell until we’re actually in the room. 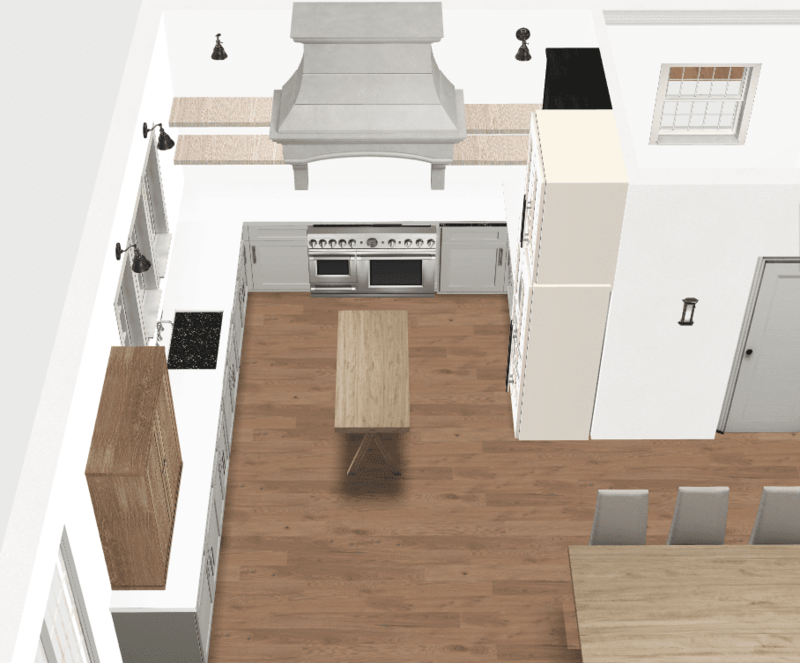 While the additional counter space may come in handy, we plan to utilize every inch of storage space in the cabinets (plus the pantry room) so I can’t imagine storage will be an issue. The 9′ dining table will also be nearby, so that could easily serve as extra counter or workspace when we have larger gatherings. Rather than an island, my first thought is to find a nice vintage rug to make it feel cozy and lived-in. 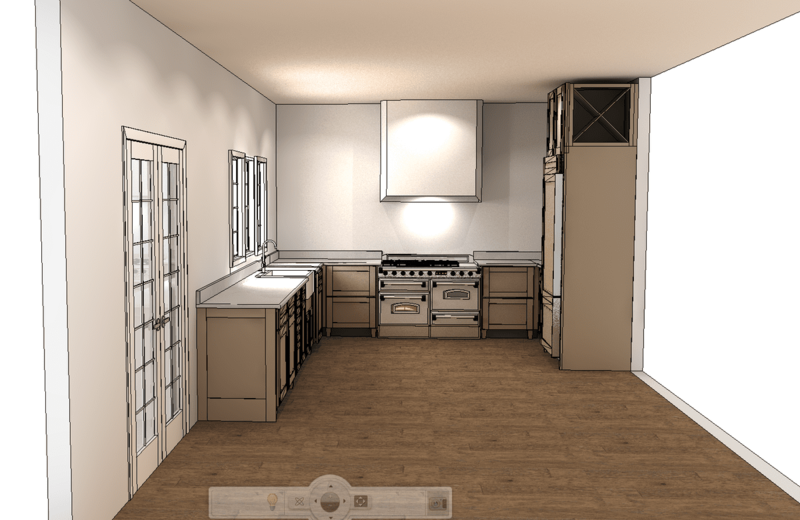 While we had to plan the majority of the kitchen in advance, I don’t want to rush into making every decision before we even have a chance to move in and live with the house for a while. That’s why I’m in no rush to find the antique wood hutch and come up with a plan for the additional cabinet next to the fridge. Ok guys—I think that covers everything! In a few weeks our cabinets should be installed and then things will really start to take shape. I’ll be back with another big update for you then, and in the meantime I’ll be sharing all of the updates in real-time over in my Instagram stories. I have been a long-time follower of yours despite the fact that, to be perfectly honest, your aesthetic isn’t at all my style or preference. However, I keep coming back because I appreciate your creativity and out-of-the-box thinking. 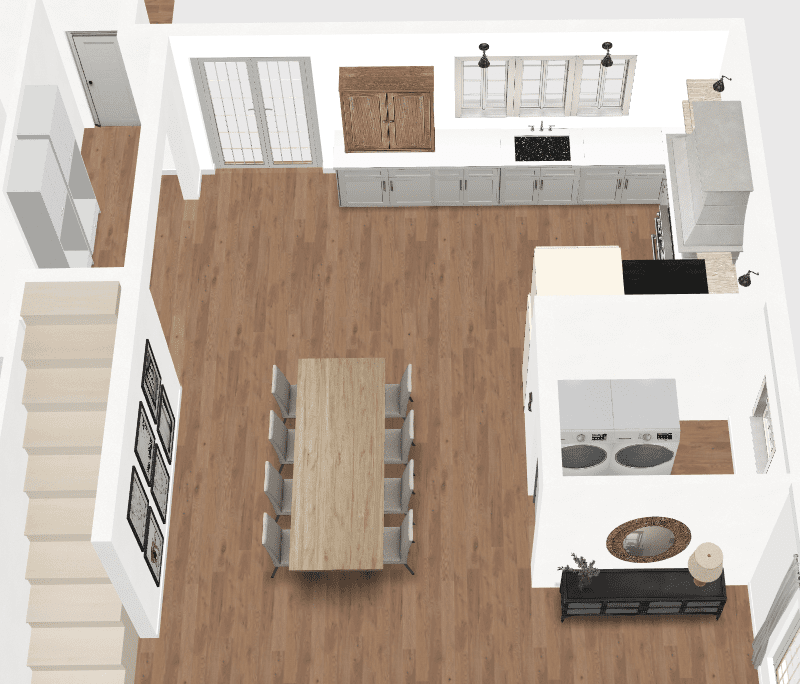 This kitchen plan is exactly what I expect and love to see from you – a thoughtful, unique design with true influences from your own personal passions and experiences. 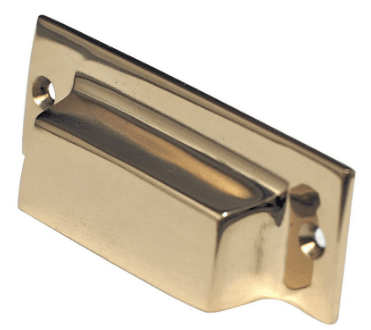 Your kitchen and entire home are going to be beautiful. Thank you for documenting your design processes with authenticity and bringing us along for the ride! Thank you Ali, I really appreciate the kind words, and your willingness to appreciate design that is outside of your own aesthetic! It’s easy to write off styles that don’t speak to you personally, and seeing past that is tough for a lot of people to do 🙂 Just out of curiosity, how would you describe your design style? Thank you for the kind words, Abigail! 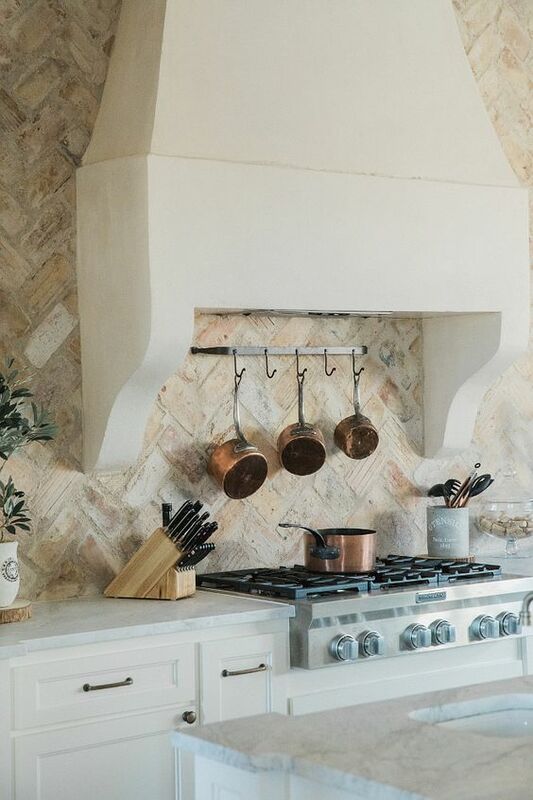 This all looks gorgeous- I can’t wait to see how the stove looks! Also, for what it’s worth, we are island-free and I very much appreciate the extra space for kitchen dancing. 🙂 Originally when we bought our house I was going to buy something to retrofit as an island, but after living with it (and not needing the storage), I’m glad we went without it. Wow. This design is absolutely beautiful and timeless! I can’t wait to see it come to fruition. I think an old, long table would look beautiful as an island. Maybe you could find one with a shelf underneath for your microwave too. Thanks so much, Mara! We are using an old (looking) long wood table right next to the kitchen in the dining area, so I think that is all we’ll need! Jenna I’ve followed you from the beginning. You were the first that I had found to explain your design process and let your resources be known. Thank you! Love your thoughts and design on your kitchen it will all come together beautifully!! Love all your ideas. 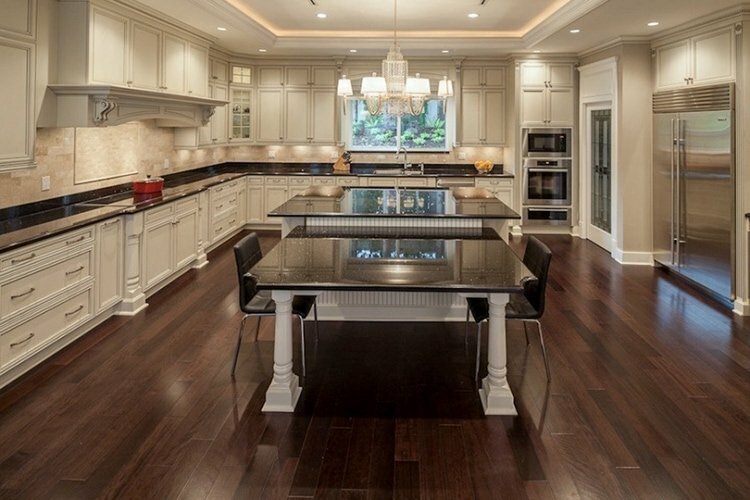 I am curious to see the marble look counter with the mushroom cabinets. Don’t think I have ever seen that combo. Can’t wait to see it! Oh my!!! This is ahhhmazing!! Can’t wait!! This is the silver lining of that dark cloud that was overhead for awhile. I am really amazed at how fast the build went. I appreciate the specifics of your kitchen storage plans. This is what I need to plan our kitchen. It has a very similar layout actually. Thanks Jenna! It’s going to be a stunner! 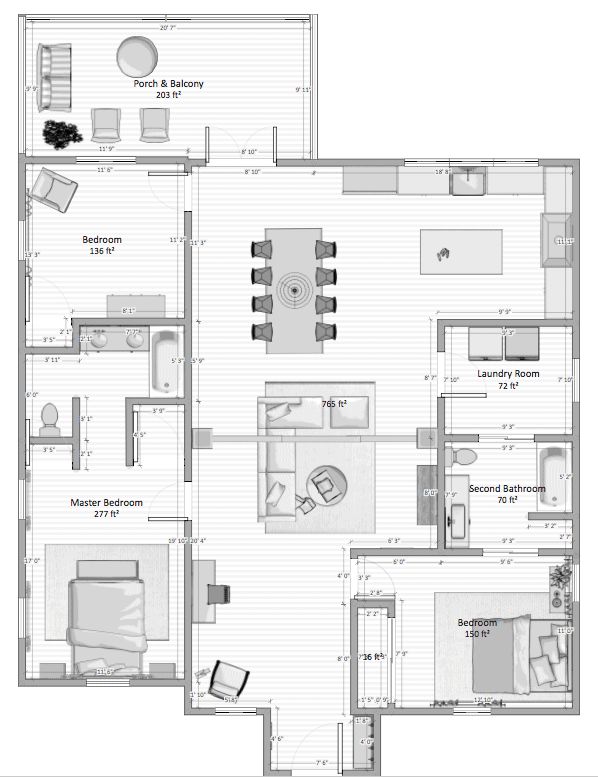 I really love your floor plan, vision, and everything you’ve selected so far. This is going to be fabulous! I also appreciate you sharing your sources and the mix of high/low. Fantastic work! This is going to turn out beautiful! I really love your hood design, and I hope you are able to make it become a reality! I also really love your idea for the wine ladder, I think that is going to look amazing…like a little wine library! I don’t know how I would live without an island and they always become the epicenter of any social gathering, so that is tough for me. I do love the cosiness of the rug but I just don’t think it would be practical! It will make for beautiful pictures though! Thanks Pamela! 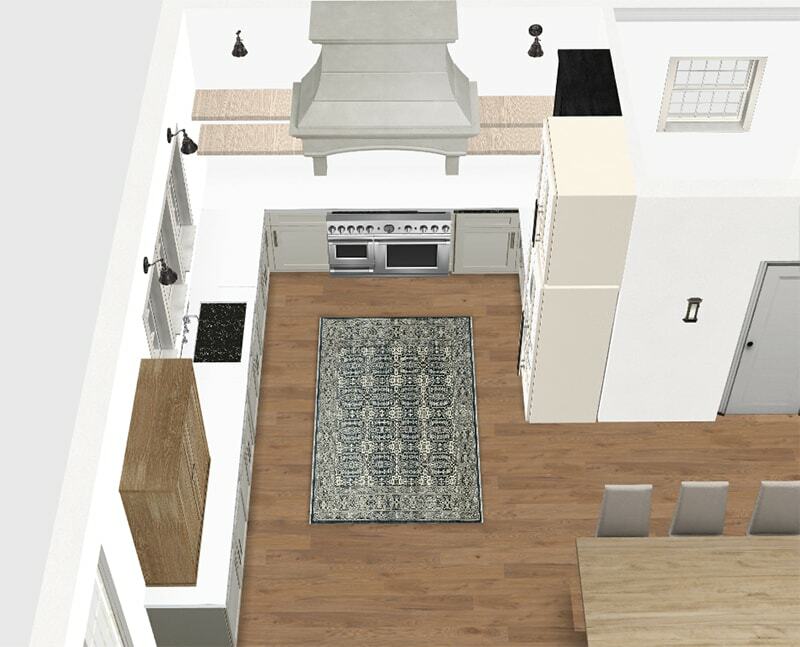 The gathering place will be the 9′ dining table, which is visible from both the kitchen and living room. We think it will functionally make the most sense that way! 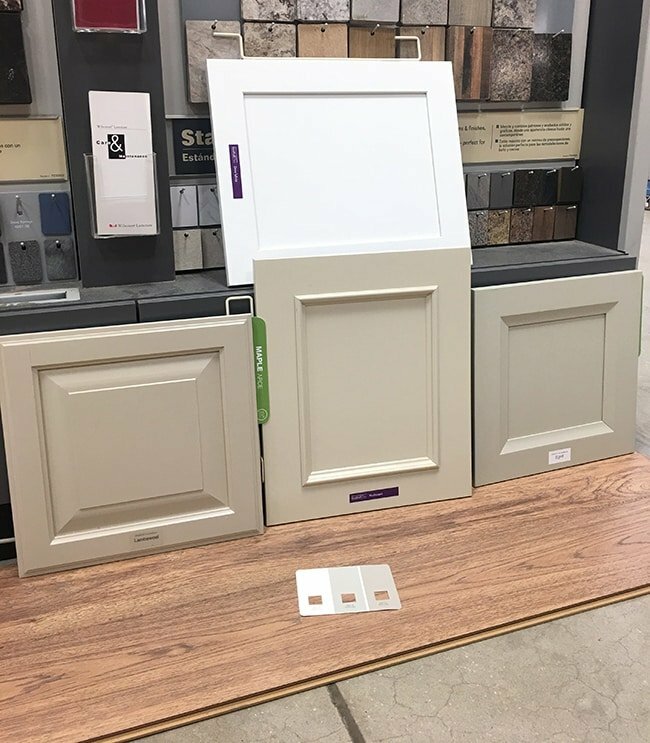 So excited to see that awesome range in place!! This kitchen is going to be amazing. Just goes to show how much work/research goes into the final decisions. That stove!!!!!!! This is going to look amazing! Classic choices and even more of that lived in feel if you can find vintage pieces to add to the kitchen. I can’t wait to see the hood come to life! Thanks Michelle — I can’t wait either! This is coming together nicely. Your builder seems pretty fantastic. 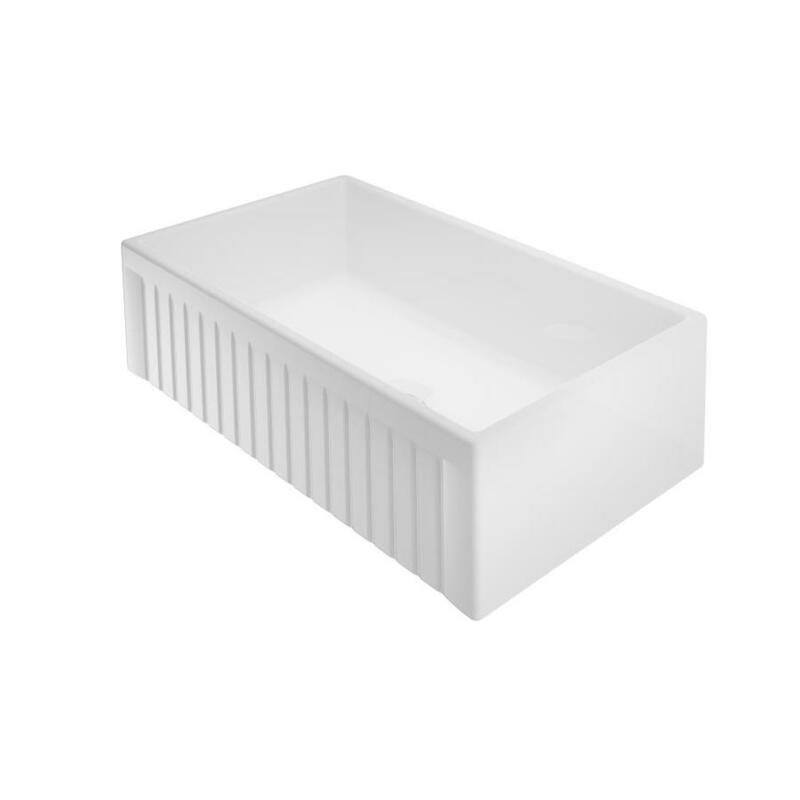 You may already have this included in your cabinet plans but having a tall opening so you can store cookie sheets and other rectangular or square pans on edge is really helpful. I had that in my old kitchen but not now and I really miss it. You can’t go wrong with that combination, I think it will look amazing! Looks beautiful, but also very functional so well done! And congratulations to the range find! My only other comment would be that yes, I think it would be wise to wait and see about the bookshelf/cabinet to the left of the fridge. When two people are working in the kitchen at the same time I suspect you might want to have full access to the counter space between fridge and stove. 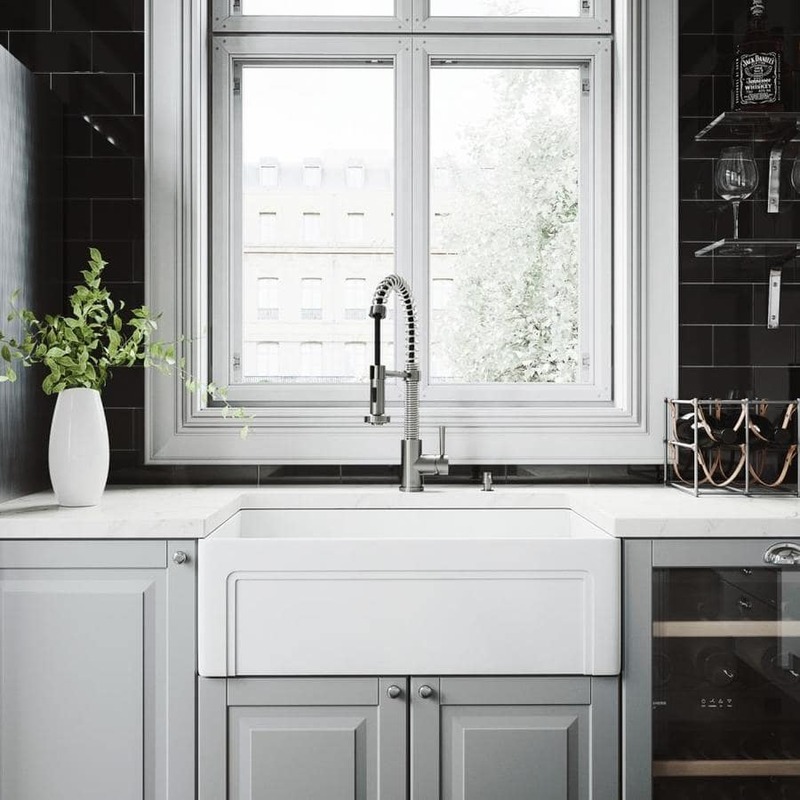 There is of course workspace on both sides of the sink but I’m guessing the area between stove and fridge would be the most natural one, together with the one between stove and sink. Really look forward to seeing this come to life! We very well might still add a cabinet there but leave a gap at the counter, so it’s just an upper cabinet. We’ll have to see if we need the storage space or counter space more! I like how you think outside the box! I really like what you’ve done with the Riverside house and the plans for your new home, with one exception. Why did you decide to have the laundry room/pantry door open into your dining area? I realize there are only two of you right now, but laundry rooms can easily get cluttered and it’s a pain to always close the door. We had this arrangement in a previous home and I was never happy with the location of the door. I didn’t like looking into the laundry from the DR table and the noise from the washer/dryer was annoying, even with the door closed. We tried every configuration possible of the laundry room on the first floor, and it made the most sense there (we’d have to lose a bathroom otherwise). We only do laundry once a week and won’t run the appliances when we have dinner parties! Plus we wanted a walk-in pantry/storage area near the kitchen so it just made sense to keep the washer/dryer in there as well. So excited for you guys!! I am really enjoying following along on your journey! 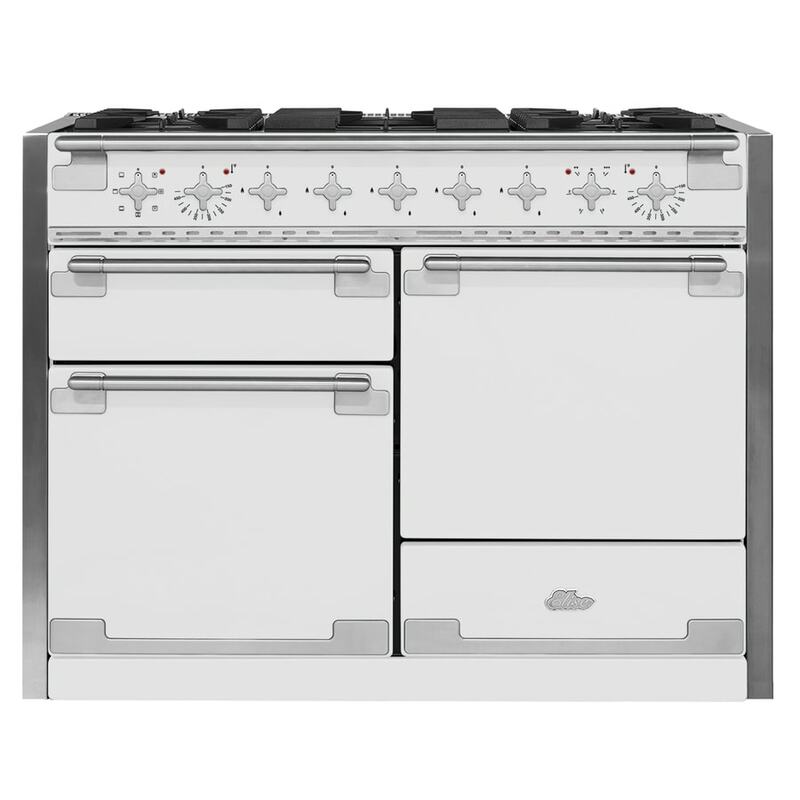 I’m still looking for the perfect range and have spent SO much time researching. 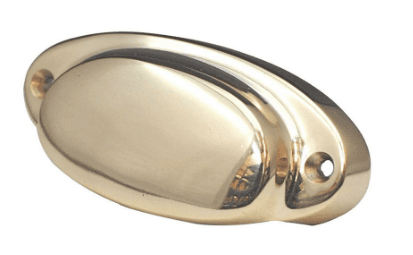 I am a serious cook as well, and was drawn to the Hallmark line…the price and look cannot be beat (and love the Italian craftsmanship). However, after reading many reviews on GardenWeb, I decided to pass. Perhaps they will work out all the “kinks”, and I can consider them when we downsize in a year or two. 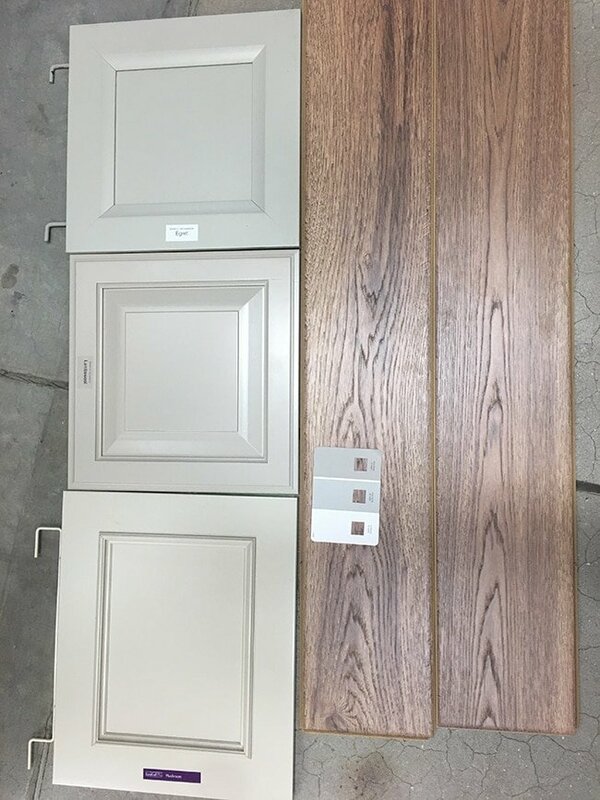 Your kitchen is going to be gorgeous!!! I have read mixed reviews too and I know part of that is because they’re a newly restructured company and are having trouble keeping up with their volume, but I thought the incredible price was worth the risk! I also purchased an extended warranty so we’re covered for 6 years. Fingers crossed! I have been following your creative process since your California ranch. I have always loved your out of the box thinking and your incredible diy projects. My husband and I have renovated 5 houses so far. I have been planning the kitchen in house number 6 for over a year also. I thought I had it all set until I saw your Hallman stove😮 I thought that look was out of my budget. Now I am reworking everything. Out with the range top and double French door wall oven.. actually saving money. 😂🤣 Thank you so much for sharing sources. I can’t wait to see your progress. This is very lovely Jenna. 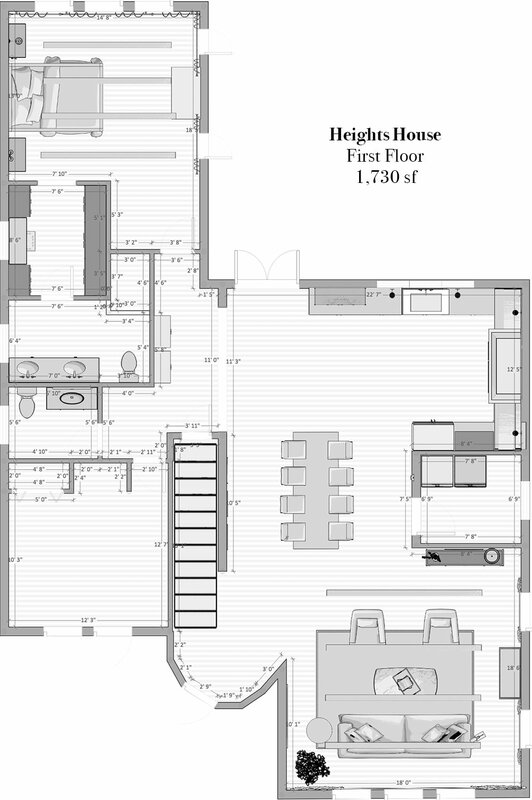 I can’t wait to see how things will come together for the Heights House. You have sure come a long way in just a few years…so proud of you! Excellent guide! I especially love the use of negative space in your kitchen layout. Quick question – what was the budget for this project?